Saturday afternoon Drew was out at Myers Park in Racine Wi birding and he seen a Bald Eagle. He did not know that the Bald Eagle was eating it's dinner at the time so he was going to try and get some pictures with the new camera. 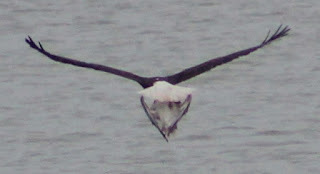 When he was about to get some pictures the Bald Eagle took off with his dinner which was a Gull. Here is a picture of the Bald Eagle with the Gull. Cool. How big of an eagle do we need to carry off lying John?